Learning how to swim on your own can be very frustrating because proper swim technique is not intuitive. So, if you wish to learn how to swim strong and with confidence, personalized swim lessons are a great choice! Fitness Quest offers personalized and small group (up to 3 people) swim lessons. Swim lessons are conducted an open water swim simulator/swim flume (see under water video from the flume above) on in the open water (additional rates may apply). The swim flume is much like swimming in the open water as it offers a continuous current to swim against…it’s like a treadmill for swimming. Each session includes a custom tailored lesson plan designed specifically for the athlete’s needs. All swim technique packages begin with a free consultation to determine if personalized swim lessons are the best option for you. Learn proper swim breathing and breath regulation. Develop your swim stroke and learn proper form. Learn relaxation techniques for a calm, confident, efficient swim. Learn swim form drills for balance, swimming tall, and swimming skinny. Includes a comprehensive email summary of each session. Includes a 3-6 week swim training plan to follow between sessions. Above and under-water swim video (optional). Above/under water swim video: Additional $20/session. 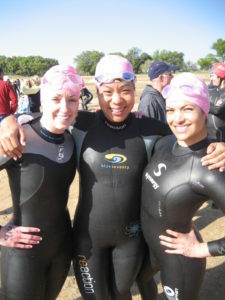 If you want to swim strong and with confidence in the open water, this Special is for you! The Learn-to-Swim Special is taught in a heated (winter) open water swim simulator. The simulator accelerates the learning curve in a controlled environment. Each session is custom tailored to the athlete’s needs. This special includes three 1:1 private swim lessons, above/under-water video and analysis of each session (a $60 value), a 6-week swim training plan, unlimited E-coaching, and much more! If you were to purchase these services separately, the cost would be over $400. Cost: $199. Guarantee: This package is so amazing, I guarantee that you will learn how to swim or you will get your money back! Doing a triathlon? 1.2 mile swim? 2.4 mile swim? Need to learn how to swim strong and with confidence in the open water? 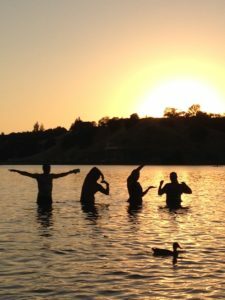 If you answered “YES” to any of these questions, open water swim lessons are for you. Features include water safety, GPS o/w swim course, real-time feed back, and help with wetsuit/equipment, navigation/swimming straight, acclimation, pacing, and more. Call or email for rates/packages. If you want more information about swim lessons or have any questions about swimming, please contact Coach Dan Foster dan@fitnessquestbootcamp.com or call 916.261.2629. You have a big part in my journey, Dan. Without you, I would have given up on the swim. Your humming advice was the game changer for me. So, thank you! Just wanted to tell you I had a really good swim today. I mainly concentrated on keeping tall with one hand out in front. The video that you showed me of the girl keeping one hand out front really helped in addition to what you said about thinking of slipping my hand into a long glove. I paused after each lap to think about what I did wrong, but mostly about what I did right. I had some really good laps and some really bad laps however; I could really tell when I was getting it right. I’d say I increased my 10% good form to 30% or more. Thanks for the great swim coaching Dan! Had a GREAT race! The swim went so awesome! My goal for the entire 70.3 race was to just get through the swim as comfortable as possible. That was it! If I did that then anything else afterwards was just icing on the cake. I was going to ride comfortably and run comfortably. So on the swim, I let everyone in my wave (F45-49) go first before I got into the water. Then I got in and started to swim. The water was cool but nice. I told myself “my swim is strong and confident” as Swim Coach Dan told me. Pretty soon I was swimming along and never got out of breath like before. I was swimming way out away from everyone and was happy that way. It got a bit wavy here and there, but nothing unmanageable. I started focusing on my stroke and pull to glide better. Next thing I knew I was at the turn around (halfway point). It got congested at the turnaround, but I kicked harder and stroked harder so that anyone around me would stay away. I came out of the water 2 minutes faster than any other half IM. I just never know what kind of swim I will have. This weekend was a great one that’s for sure!! !